In today’s fast-paced business environment, there is a serious need for stability and transparency when it comes to reaching a formal agreement between two parties. Despite the fact that working with a service provider is built on trust and preferably backed by a clean historical track record, clear contracts are still a must. WordPress hosting is a sensitive domain, especially due to the value of digital properties and data, and thus, there is a need for compliance to legal standards, and due diligence, which usually happens during the lifetime of a business. These require standardized contracts, with clear terms and responsibilities and authentic signatures. The agreement between the parties comes at the cost of the initial virtual handshake on the delivery and retrieval of the services, and in our case, the managed WordPress hosting service. On the other hand, the authenticity of a signature is quite controversial. To start with, the introduction of contracts has demanded the question of using physical or digital signatures. A careful research soon followed, with the purpose of clearing out the benefits and drawbacks in the long run. The most common problem was that there were always “buts” in each description or fine print of either a service or a country policy, and exceptions made finding the common denominator strenuous. Digital signatures were thrust into the limelight in the ‘80s after the RSA algorithm was invented. This algorithm was used to create a rudimentary form of digital signature. The breakthrough for these kinds of signatures came later on, in 2000 when the US passed the ESIGN Act and made digital signatures legally binding. In 2014, the European Union introduced eIDAS Regulation, which recognized the digital signature as legally assuring as the pen-on-paper, across the borders of the EU’s member states. All these changes generated a bang at the time they were introduced. Nevertheless, most countries don’t officially accept them as valid, and most companies prefer to use the traditional way of handling contracts. So it’s a territory that is not completely charted. We’ve extended our research to solutions like HelloSign, Adobe Sign, SignNow, DocuSign, PandaDocs. We have even tested the HelloSign API and integrated it for a trial, but it did not pass our internal legal review. Physical signatures, also known as wet signatures because of the customary ink in the pen, used by the beneficiary to sign on the dotted line, still represent the most popular choice in entering into contracts. The model exists since early stages of humanity, at first as a sign of identity, and then, as a marker of certitude in agreements. Dubbed as “the traditional way’, it still is the most popular method of handling legal documents. Although electronic signatures are on the rise, estimated to have reached almost 700 million last year, we’re still far from referring to the pen-and-paper signatures as obsolete. The signature of a document makes full faith until proved otherwise, with the consent of the party that has signed it with regard to its content. When the signature is electronic, it is valid only if it is reproduced under the conditions stipulated by the law, but the law on electronic signature can be different from country to country, having different particularities; while the physical signature is universally valid. Having a validly signed document brings benefits to both parties, both in terms of contractual relationships between them (e.g. by having the possibility to exercise the party’s contractual rights), and in terms regarding the legal relations with third parties (e.g. the possibility to present to the authorities – including tax authorities- a valid supporting document on the basis of which the services and payments between the parties are performed). Since our beginnings in the WordPress hosting industry back in 2011, we’ve worked with quite a few respectable providers such as Hetzner, Leaseweb, Amazon AWS, Singlehop, and Digital Ocean. Also, for us, being involved in the due diligence process of acquisitions of WordPress-powered digital properties has influenced our path towards adopting a set of good-practice legal samples and also a list of requirements to enforce more suitable contracts. Some of our service providers use the electronic signature as a form of contracting. Ticking the box of agreeing to the terms and conditions at the end of the registration process ensures the validity of the contract. Here, the need for a signed document becomes obsolete. Other providers require signed contracts before offering their services. The process begins with a request for an ID or a document to verify the client. This action allows a more secure and transparent bond with clients. 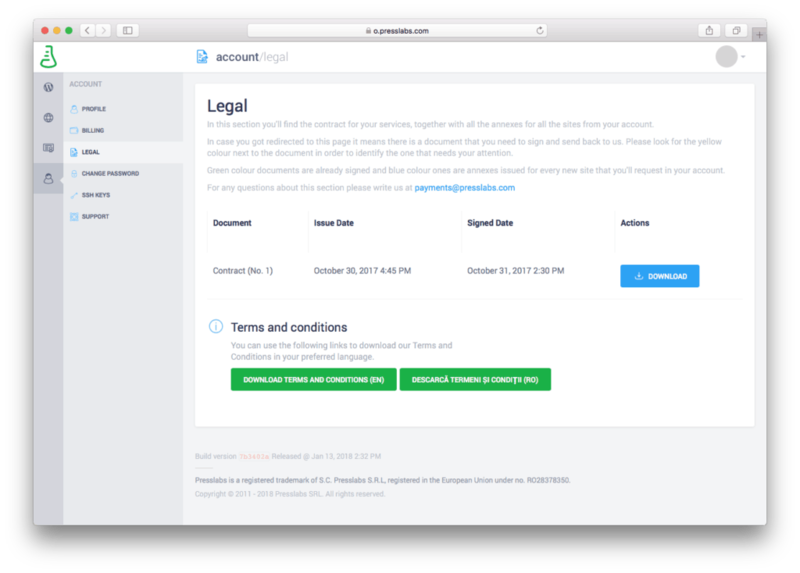 Legal, our newest section in the dashboard has been introduced with the aim of bringing awareness to the necessity of legal agreements. Here, clients could easily access their contract and read the Terms and Conditions. Our contract contains essential information such as the provided services, price, and payment method, contractual period and other clauses like the agreement of reading the Terms and Conditions, but also particulars about the concluding parties. The contractual period extends to one month, and it extends every month unless one party notifies the other that it wishes to discontinue the use of the service. So we stay loyal to our lasting principle: no lock-ins hidden underpayments made in advance. Furthermore, an additional document called “Notes” is issued for each one of the client’s sites, without the need for a signature. For agencies, the development sites are now included in a “Development Package”, without any additional costs or notes. The complex and diverse managed WordPress hosting ecosystem could largely benefit from a more honest discussion between providers and clients where expectations are clearly written down in contracts, beyond marketing proposals and features lists. Adding numbers to these features is possibly a next step in the evolution of managed WordPress hosting. In case you wish to contact our administrative team, feel free to drop us a line at billing@presslabs.com.